Rapidly growing Indian economy will call for a transformation of Indian agriculture over the next 30 years that will have profound implications for diversification for rural urban migration, for agricultural profitability and food security. Challenges to government policies would be daunting and most likely will require a fundamental reorientation. IRADe is involved in this study and has developed a general equilibrium model to explore the issues. IRADe carried out an in-depth research to understand the drivers of growth and livelihoods and obstacles in the selected districts and clusters where Sir Dorabjee Tata Trust (SDTT) supported projects are undertaken by its partner NGOs. IRADe assessed the production and resource potential and devised strategies in consultations with stakeholders and participating NGOs to overcome various challenges encountered by the region,strengthen the clusters and generate synergy using data and analysis for Bahraich, Kushinagar and Shravasti districts, some of the poorest districts in UP. In these districts electricity supply is poor, extension services are inadequate and certified seeds are not available in time. The irrigation potential of canals in Bahraich and Kushinagar is not fully realised due to siltation and poor management of canals. Private diesel operated tube wells are expensive. Credit to small and marginal farmers are inadequate.There exist large gaps between actual and potential productivity for major crops. Lack of proper marketing channel both for purchasing farm inputs and selling produce hampers diversification. IRADe suggested strengthening of extension services with agri-clinics and agri-business as partners, improving canal management and diversification of agriculture to cash rich crops and measures to fully exploit the value chain of crops by utilizing byproducts in productive activities. Key recommendations: Some of the major recommendations and interventions suggested for the area are to Improve livelihood opportunities to the area with promoting, fisheries, poultry, medicinal plants, mushroom farming, promoting horticultural activities. Other recommendations comprise of improving access to electricity through distributed solutions like gasifier, biogas. Improve access to water and sanitation through low cost solutions like sand filters, toilet linked septic tanks, flood proof hand pumps and toilet structures, low cost bamboo based toilet enclosures. Under the project IRADe prepared detailed PRA reports of the surveyed clusters and 4 detailed reports: Vision plan for SDTT and three district level plans for Bahraich, Shravasti and Kushinagar. Sponsored by Sir Dorabji Tata Trust (SDTT), Mumbai. This study entails estimation of demand for Natural Gas in the Indian Fertilizer Industry. The objective of the study is to understand the policy options of the Central Government in the face of changing fertilizer future demand and supply scenario of Natural Gas at the global level with particular emphasis on India. 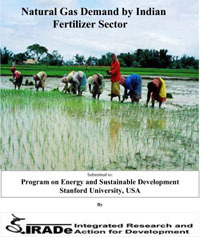 IRADe carried out this study to analyze the fertilizer demand, to access the impact of various feedstock prices, to estimate the total subsidy for the fertilizer sector, to suggest range of policy alternatives, to recommend viable policy and reform options for policy-makers for India and to carry out a comparative study of domestic policy and global fertilizers policies. The Planning Commission, Government of India awarded IRADe the research project to study the implications of extending the Minimum Support Price (MSP) to more states. 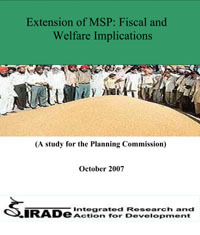 After the analysis of implication on the welfare of producers and consumers in Madhya Pradesh and Uttar Pradesh, it was recommended that MSP could be extended in many states, because, more states are growing rice and wheat than earlier. There are national gains in reduction in transport of grains and more equitable benefit of government policies. 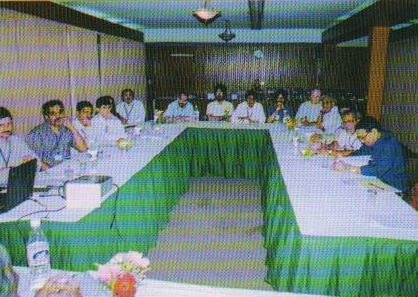 Introduction: IRADe organized a workshop on April 20, 2004 at India International Center, New Delhi for launching the Stanford-IRADe project to receive suggestions at the inception stage. The overall objective of the workshop was to discuss the various features in order to upgrade the general equilibrium model. The experts and representatives of World Bank, Stanford University, ICAR, NIPFP, NCAER, IGIDR, Planning Commission, Ministry of Power, IARI, DFID India, USAID, Ministry of Environment & Forests, Reliance Industries Limited, Indian Statistical Institute (ISI) and University of Delhi attended the workshop. Dr. P. Ghosh, Secretary, The Ministry of Environment & Forests, (GoI), who earlier did computable general equilibrium model, inaugurated the workshop. Professor David Victor of Stanford University gave a keynote address after which, Professor Kirit Parikh gave a substantive presentation concerning the objectives, methodology, possible outputs and policy implications. The workshop recommended addressing questions directly related to decision making for land tillers and land owners and poor and small farms such as disaggregation of farmers and some scenario related to WTO. 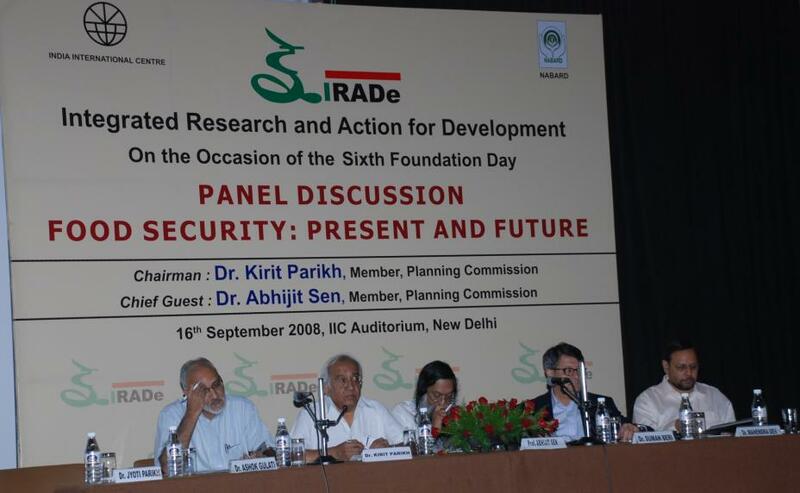 Workshop on Food Security: Present and Futures, 16th September 2008, New Delhi Introduction: IRADe celebrated its 6th Foundation day with a panel discussion, organized on “Food Security: Present and Future” at India International Center on 16th September, 2008. The workshop was attended by renowned academicians and NGOs. Dr. Kirit Parikh chaired the penal, and Dr. Abhijit Sen, Member Planning Commission was the chief guest of the event. The eminent panelists were Dr. S. Mahendra Dev, Chairman of CACP, Dr. Ashok Gulati of IFPRI and Dr. Suman Bery, Director General, NCAER. The domestic self-sufficiency ratio for food-security needs to be optimized. Climate Change and food security issues should be dealt together. To enhance food security, we need to focus on yield growth in agriculture, a national development strategy for handling the issues of excess labor in agriculture sector, nutrition management of arable land in India, institutional approach for collective action and rational use of irrigation water. Policy Reforms are underway in many sectors. These have generated path-breaking programmes, schemes such as RGGVY, MNRE schemes on solar cities or village energy security programs. They have potential to increase economic efficiency in rural areas. Some of them may need to be more effective. To appreciate ground realities facing the schemes, programmes and policies, IRADe has surveyed and examined impact of energy sector reforms on poor and rural sectors. Each study has analyzed and has generated suggestions and recommendations to enhance the effectiveness of the government programmes. The MNRE, UNEP and UNDP have utilized services of IRADe in conducting International training programs on renewable energy and gender issues. The Ministry of power had awarded a study to IRADe to access franchisee system in Assam, Nagaland and West Bengal. REC awarded further studies to IRADe for evaluating the franchisee systems operating in different district distribution circles in states of Assam, West Bengal, Nagaland and Rajasthan through sample villages in these states. MoP project covered villages in Bankura district, Dibrugarh district, Nagaland & REC project survey included villages in Purulia, Jodhpur and New Bongaingaon districts. Conclusions were drawn from the studies that franchisee requires adequate supply of power of good quality maintained by utilities to work effectively; capacity building of franchisee should be done in the beginning. A part of 90% subsidy provided under RGGVY projects should be given by the govt. to the rural population. 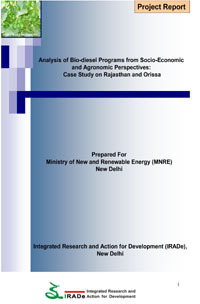 Analysis of Bio-diesel Programs from Socio-Economic and Agronomic Perspectives: Case Study on Rajasthan and Orissa. This study attempted to identify and fill critical knowledge gaps, which currently inhibit effective policy on Bio-diesel in India to delineate the key challenges in the Jatropha cultivation in consonance to find ways to scale up the outreach of services to the poor and vulnerable. The study analyzes various socio economic parameters, agro climatic conditions and other multi stakeholders consisting of oilseeds cultivators, with regard to Jatropha. The project identifies the primary barriers of Jatropha plantation for socio-economic feasibility of a multi-stakeholder system with a focus on rural population. Biofuel promotion is a very complex issue dependent on knowledge, infrastructure support, policy issues, political environment, inter-sectoral cooperation and linkages for the cooperation and technology promotion and transfer. Feedstock supply and management chain emerge as a most important issue for the promotion of Bio-diesel from Jatropha, considering site-specific climatic, agronomic, economic, and social conditions. The project was awarded by MNRE. The MNRE had provided the villages’ residents in four states namely Rajasthan, Haryana, Uttarakhand and Gujarat, with solar cookers and solar water heaters. Overall the users of solar thermal products were satisfied. 90% of users felt that food cooked with solar cookers tasted better and good for the health. They were happy that solar cooker did not require fuel, and needed little maintenance. They were aware that solar system had long operational life, can be used during day, but also depends on the seasons. The project was awarded by MNRE. The MNRE had provided the residents of remote villages of India, which could not be covered by national power grid, with solar home lighting systems and solar street light systems. It was observed that target oriented approach was followed during implementation. During implementation by parties, MNRE guidelines were not adhered to in totality by implementing agencies. Approximately 15% of the systems were found to be non functional. Maintenance and service support from equipment suppliers desired improvements. The project was awarded by MNRE. The MNRE had provided the villages’ residents in six states namely Rajasthan, Haryana, Uttarakhand, Gujarat, Manipur & Karnataka, with solar home lighting systems, solar water pumps, solar lanterns and solar street light systems. The Study was structured on field visit based verification and collection of beneficiary level information; on functioning and maintenance of systems, and satisfaction level of beneficiaries. The life-style of beneficiaries has changed gradually following work done under the scheme. The benefits accrued were, working hours for useful tasks have increased, study hours of children increased, consumption of kerosene declined, environmental accidents such as snake and insect bites declined. Beneficiaries have started using mobile phones, radios, telephones etc. “Role of Renewable Energy in Energy planning and expanding Livelihood Options”, 14-22 March 2007. Prof. Jyoti Parikh, Executive Director, Mr. V Subramanian, Secretary MNES with the participants of 3rd International Training Programme.